Lycian Wicca priestess. Perpetual student. 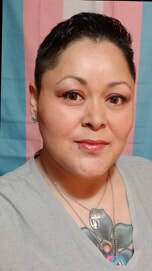 Lead Coordinator for San Antonio Pagan Pride Day. I have been openly Pagan here in south Texas since 1985. Want to know more? Visit my personal website, Wiccan, Pagan, Texan, or find me on Facebook. Hereditary Witch, Thelemite, Priest(ess) in the Chrysalis Circle, Trans* Rights Activist, LGBTQ+ Ordained Minister, and self-proclaimed Geek Deity of Geekdom. Openly practicing and out of every closet since 1995. Want to know more? Visit my website San Antonio: Non-binary, Genderfluid, Genderqueer, Two Spirit Trans*, etc. Feedback: Please contact us about how to make SAPO events even better; your input is welcomed and appreciated!